It’s been a long time since I’ve showcased at any wedding fair, so if you’re in Sligo this weekend, you won’t find me at the Fairytale Wedding Show, but here on this website you’ll find more than enough info & images from my wedding photography. And if there’s something you don’t see, just contact me, and I’ll be in touch with everything you need to know & more! Even though each wedding is different & the people involved are always unique, here in a nutshell is how I approach each wedding I photograph! 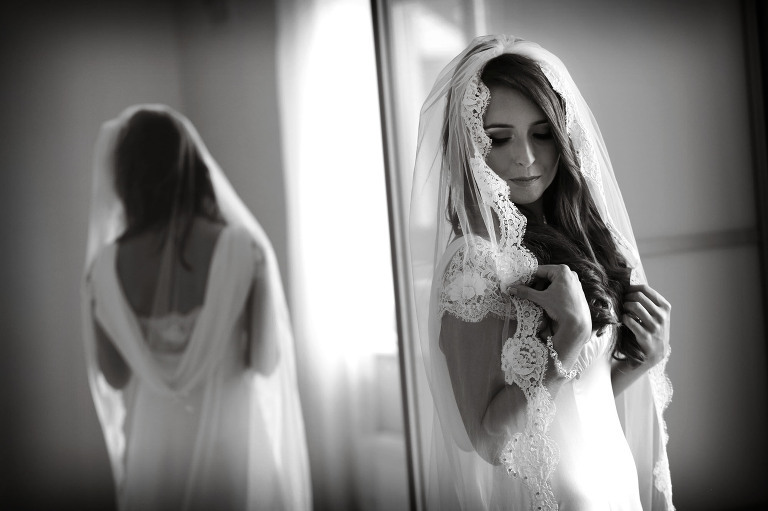 My style of wedding photography is a mix of documentary, natural & relaxed portraits. I go between each style on the fly throughout the day. I’m not a pure out & out documentary photographer, yes a lot of the day is shot that way, and what I capture is real & not posed, so for example if I have a picture of the groom or somebody looking at their watch, it’s because I caught that moment, I certainly didn’t ask the person to do it! But a pure documentary photographer won’t capture family pictures or bride & groom photos alone, I do however. So my style as mentioned is a mix of documentary & casual portraits. I start 99.9% of my weddings in the morning & the majority of that time is shot documentary. I always say there’s enough going on that you don’t need another guy getting in the way, so I like to step back, and capture everything as is & how it happens in front of me & my camera. I work on my own at weddings. I like to shoot unobtrusively throughout the day & to do this I tend to keep a low-key approach during the day and shoot by myself. But I’m a tall guy, 6 foot 2, but somehow I manage to disappear quite easily when necessary! I have a quiet disposition for the most part & this lets me capture intimate moments. 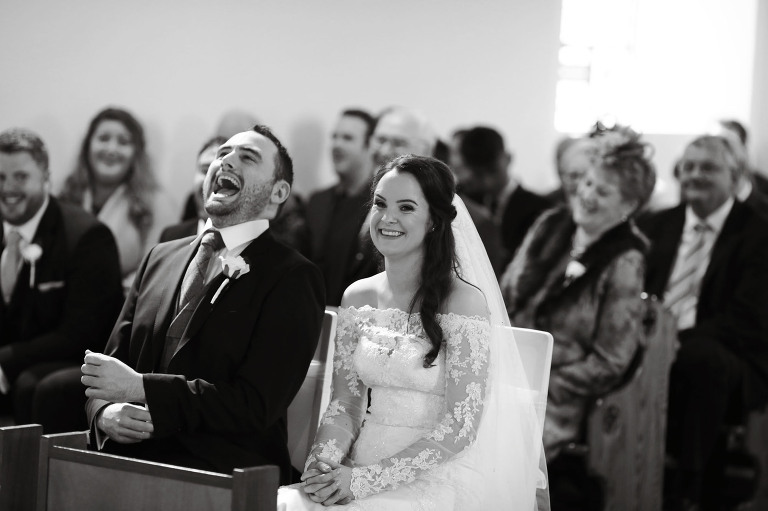 Knowing how to read people & the situation is super important on a wedding day…knowing when not to press that shutter is just as important as knowing when to! As soon as the bride & everyone is dressed, I do like to try to have 10 minutes to get some portraits. 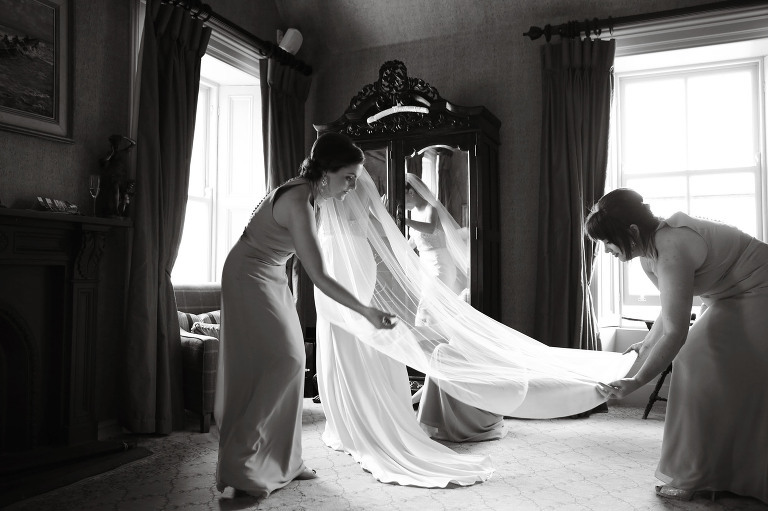 Everything & anything can happen on a wedding day, so it’s important to get try to get dressed as early as possible…something always slows down this bit of the day! If at all possible, I’m leaving to get to the church 15 minutes ahead of the bride, as I do think it’s right if the girls have time before the ceremony with no photographer around. And not only that, I have a groom to photograph too! As soon as the bride & girls arrive at the ceremony venue, I am back into documentary mode, and capturing everything that is happening before the all important walk up the aisle. Again, every wedding is different & sometimes this part of the day is emotional, or it’s full of laughs like Linda, her dad & the girls above! On to the actual ceremony, and for this I am shooting 100% documentary, usually from the side of the alter. I’m capturing everything that happens in the most unobtrusive way possible. I’m looking for & trying to anticipate looks, laughter & anything else that might happen! Also during the ceremony, but also at every other time of the day, I’m always on the lookout for unique details that you’ve spent time choosing to include at your wedding. I’ll capture them also, and if possible with some context, like the shot above…the cuff links, bracelet & rings on their own would be nice sure, but the shot above has so much more meaning and recently the bride, Tracy, said this particular image is framed and hanging in their kitchen! After everything is signed & the marriage is official, I start taking pictures of the recessional right as the bride & groom start walking, so I have the full length portraits, unobstructed, but it’s this kind of image I love just as the couple hit the midway point when people start stepping into the aisle to get their own pictures & congratulate them at the same time! I have absolutely no problem with anybody taking pictures around me at a wedding – trust me, guests with a camera/phone are very easy going compared to most Formula 1 photographers who I used to have to work alongside, all 50 or 60 of them!!! I’m not one of these photographers who wishes for an ‘unplugged’ wedding. It’s not my place to ask the bride & groom for that, it’s their wedding day, not mine, I’m really just there to document it. It’s then time to meet & greet your guests, pretty much all of them! At the same time, I’m going to try to capture as much as possible. Always bear in mind that this part of the day can take anywhere between 15 to 45 minutes! As soon as all that’s done, as long as the weather is ok, and there’s a decent spot where the light is nice, I’m going to get the family pictures done. While not the most exciting part of the day, these images certainly are some of the most important, so we’ll definitely get them done, but they don’t have to take all day, 5 to 10 minutes maximum! After 400 weddings I know how to get all the different combinations done quickly, and we’ll have the classic group line up, but if something funny happens around the group shots, I’ll definitely capture that too as it might just end up as an award winning shot or getting featured around the world on the Huffington Post or New York Post!! Next up is time for couple portraits & a few of the bridal party. Again before the wedding ever happens, we’ll have gone through where the location shoot will be done, whether it’s en route to the reception or at the actual reception. Either way, I generally have the bridal party done & finished in about 3-5 minutes, then need the bride & groom for a further 15-20 minutes. This is actually some of the only time during the day you’ll get to spend alone, so some of the time I am actually just leaving it to you to chat & take in everything that’s just happened! I shoot quickly & most of the time it’s light that’s super important, location is second. So it’s not all pose, pose, pose, it’s relaxed posing…I’ll find a good area, and we’ll roll with it. Depending on location, I’m almost shooting landscape style shots & included the bride & groom. Other times, I’m more focused on the moments between moments. As you’ve more than likely done the engagement shoot with me before hand, this part of the day is easy, and you know how I work & what I look for! We’ll generally look for a few different areas within the same area if that makes sense! Again light is the most important factor at play and will determine where we can shoot sometimes! Finally having done all the family groups, the bridal party & your own couple photos, it’s time to spend the rest of the reception with your guests! Again at this point, I step back in documentary mode & try to blend in with the crowd to capture the vibe at the wedding, and look for all the stories within the story! And I always say at this point or any time during the day, if there’s some special picture requests, we’ll get them done then! It’s time for the big entrance for the wedding meal! Now whether or not you have a tractor on hand like Colin & Catriona below is up to you!! But either way, I’m capturing this & the louder & crazier the crowd in the room are the better it makes for pictures! So there you have it, I like to get to know the people who choose me to photograph their wedding, that’s where the engagement shoot comes in handy, as it gets you used to being in front of the camera, so when I’m there on your wedding day, you’re already comfortable with the camera & how I work, and this allows me to tell the story of wedding day through my pictures. Afterwards, is when we get down to creating what will become one of your most cherished possessions, your wedding album. And it’s over time that the album becomes a family heirloom, 5, 10, 20 years down the road! 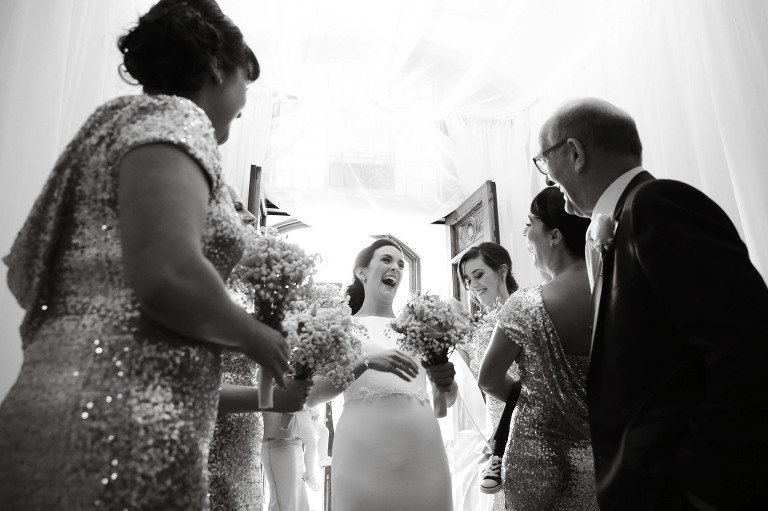 While your images are important right after your wedding, they gain in value over time & it honours me to think that in 20 years or more, they’ll still be looked at probably by new members of your family!